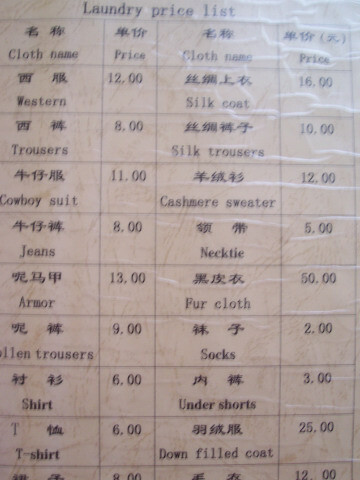 The campus hotel in which the string school participants are staying comes with an impressive list of possible garments that one may need cleaning during a stay at the CAS. Apologies for the blurred photo. String school reaches its half-way point and with it I'm feeling that this has been the most beneficial school I've attended yet. The school is nominally aimed at those who've never seen string theory before though, as I'm coming to realise, however good a physics school is it's virtually impossible to give a good grounding in any major topic from scratch in such a few lessons. For this reason, because I've been reading through string papers and books for the last couple of years and giving myself a reasonable basis in geometry and topology, this course is consolidating things that I know and filling in some of the gaping holes in my knowledge at the same time. Unfortunately though the lecturers are all extremely good I think that those who really don't know any of these areas and are not exceptionally fast (which some of the students here really are) will be pretty lost when listening to lectures on tachyon scattering amplitudes and Dolbeault cohomolgy. Still, even if you're not following the subtleties of the lectures, each time you hear an important phrase repeated it slowly embeds itself in your subconscious to build up the web of understanding which is an important step in getting to grips with these strange worlds we inhabit. They're also giving us a decent number of exercises which really is the best way to learn the subject. The end of the lectures on SUGRA were enjoyable but the pace picked up vastly as, in four lectures we went from a premise of no knowledge of supersymmetry to a homework assignment of calculating the D3 brane solution in IIB SUGRA including working out the number of killing spinors. A fine problem to tackle but far from trivial for someone who hasn't played around with spinors in higher dimensions late into the night. After my ping-pong-antics in the depths of winter I figured that I'd be a little less likely to be laughed off the court if I took to the basketball arena. With clunky shoes and a shiny new ball in hand I strode on to gasps of amazement from the comparatively diminutive locals who were on the court at the time. I was quickly snapped up by a team, happy to have the tallest player by almost a foot. We sat back and watched as highly skilled players darted and drove, fakied and generally showed off their impressive techniques. My heart sank just a little. For the first three games I was the star of the show as I simply stood by the basket, gave a little bounce and placed the ball in the hoop. At this point I realised that I'm comparatively tall but about as fit as a barn hog. It took them only a little longer to realise their long-term mistake. By this point the speedy Chinese had also noticed that it didn't take a great deal to stop my one-man assault on all other teams and quickly my reign was over. I shall be back again though the colour I turned after five games means that I should probably take things a little easier next time. I should also perhaps slow down on the kung pao ji ding. I'm reliably informed that the football going on at the moment is somehow more important than that which fills the screens at all other times. 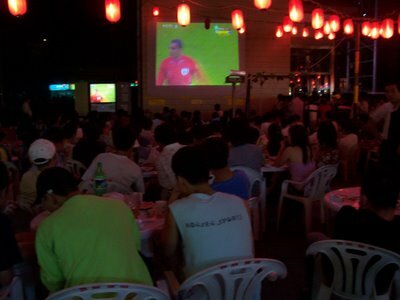 All outdoor drinking venues and most indoor establishments seem to have been decked out in the newest, largest and loudest entertainment systems to keep the beer and football hungry crowds satisfied. I feel like a real grump as I sit there being far more amused watching the crowd than watching the football but I just don't get carried away by it all as everyone stands up and cheers, hugs and high-fives as a goal is scored. My Chinese friends are most perturbed by this English man who clearly has half of his life missing. The England game came along and we watched the first half surrounded by wonderful food which drew my attention far more than the match. Mini-spicy lobsters go from the tank to the tray in a matter of moments and all manner of gastropods ooze along before being prepared in whichever style you prefer your molluscs. Half way through the game we all retired to a friends house where I could keep half an eye on the game while being initiated into the interesting and sometimes cruel world of Mahhjong. It appears to be one of many games which at first sight doesn't appear to need a great deal of skill but I'm sure there's much more to it than that. Unfortunately my unclouded blank mahhjong slate meant that I wasn't thinking too much about it and I took the first six of eight games. Soon I began to see the intricacies of the game in more detail, it all became a little more complicated and with that flash of insight my winning streak was quickly annihilated. Anyway, despite the fact that I'm never likely to win again I'll be returning to the table to wile away a summer night at some point soon. Mid-mahhjong rounds we popped to a local club to sweat-off some of the duck calories on the dance floor and were faced with an MC of impressive pedigree. Having come here from LA he claimed to take all the bling out of hip-hop and take it back to its roots. Unfortunately along with the bling he took the rythm and bounce leaving a crowd of rather unimpressed Koreans wondering what we were all supposed to be chanting. I mentioned in the previous post about some of the delicacies that are regularly consumed at the local drinking venues. 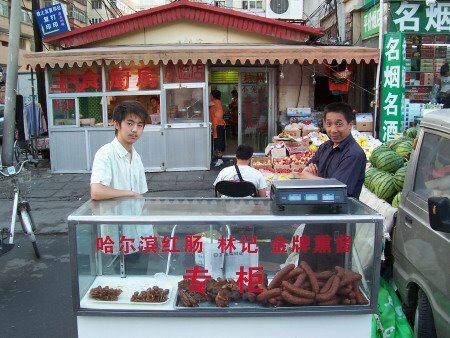 This stand, two minutes walk from my flat, has not only an impressive array of anatomical delicacies but a vendor with impressive eyebrow action. Today I returned to one of my favourite pass-times. Sitting in a cafe, drinking a fine mug of slightly low-grade coffee and working through some maths problems. This time Andrew came along too and we spent a good few hours making sure our understanding of the mathematical background needed for compactifications was up to scratch. We covered a good deal of ground and feel ready to tackle tomorrows lectures on compactifications, heterotic string theory and p-brane solutions. Along with a two hour English class that I'll be teaching tomorrow evening it looks like being a busy day. How come you never mentioned you had a class act George Bush coming out to lecture on this course on compactification and p-brane solutions? Won't he have other fish to fry at present? Glad it's going well though. Keep up the fun. It's nice to know there is someone else out there not watching the football - even if they are on the other side of the world. I am extremely jealous of your gastronomic opportunities I must say - spicy mini lobsters indeed. I believe our respective mothers are coming up to Norwich on Wednesday, for a school trip to the Sainsbury Centre. I will tell her I have been in touch with you. 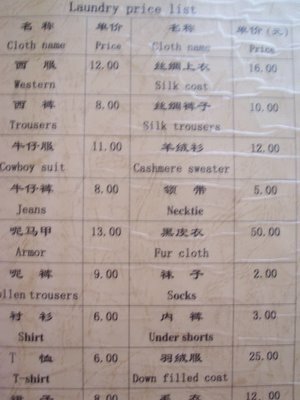 Can I send you my clothes to wash? Hi Clare, we can sit back and watch the rabble feeling smug if slightly alone. When you get out here you'll be able to sample all the culinary delights of Hong Kong. Many wonderful things to sample indeed. Many thanks and send my love to all mothers for which it is appropriate. B.T.K and K.O.C, if you can get hold of Neil Armstrong they're doing a great three for two deal this week. Shelley, if only it hadn't just come back from the cleaners! Yes, things are hectic as ever but still generally enjoyable. The treat in the middle are pig's snouts, to either side are miscellaneous porcine treats.